It really is mind-boggling. Bell Canada Entreprises (BCE) is the leading telecommunications company here in Canada. Due to long-standing monopoly or near-monopoly conditions in many parts of the country, including my little corner of the woods, I have little choice but to be one of their customers. For example, they are the only wireless provider that I can actually use at home. I used to have a Rogers cell phone, but I couldn’t use it in my own house, because the signal was so poor. Rogers’ own customer service was atrocious as well, but that’s another story… I ended up switching to Aliant (a local BCE subsidiary) just to be able to use the cell phone at home. I only have a pay-as-you-go phone, and I only use it for emergencies, but of course I still have to pay a $10 monthly fee regardless of how little I use it, so I want to be able to use the minutes that I am accumulating for long-distance calls instead of paying for them with my regular land line. I have been with BCE for satellite TV for 10 years now, and with them for cell phone service for several years. I have also been with Aliant for my land line for 15 years. So objectively I am a long-time customers and Bell and its subsidiaries have made quite a bit of money with me. What is driving me crazy is that, after all these years, Bell Canada still has one of the crappiest web sites that I have ever used. They recently revamped it, but apart from a new logo with ugly kerning and other new “snazzy” graphics (inspired by—guess who?—Apple and the iPhone), it is the same old crap, and it’s atrociously painful to use. First of all, there is the speed. I know that I have a relatively “slow” Internet connection and I know that secure connections are typically slower than regular, unprotected HTTP connections. 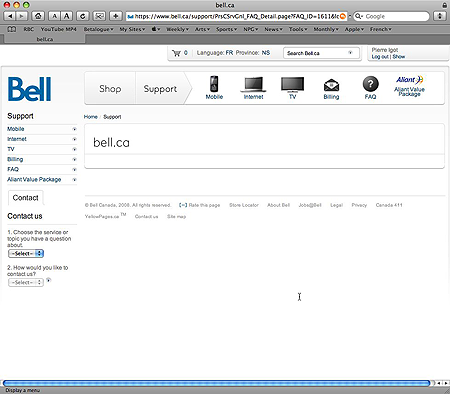 But I use all kinds of other secure web sites, and none is as slow as the Bell.ca site. It is simply excruciating. There are numerous other problems with the site. But what really drove me nuts this morning was that I had to change my credit card information. Credit card information changes are a fact of life. The expiry date changes, or the whole card number changes. This is inevitable. This means that, eventually, every user who pays with a credit card will need to be able to access and edit his payment information. Lest we forget, credit card payment is actually a convenience for companies such as Bell.ca. They don’t have to process other forms of payment. They can just charge your credit card automatically every month. It’s convenient for the user, but it is particularly convenient for the company. So you would think that they would make an effort to ensure that keeping one’s credit card information up-to-date is as easy as possible. There I was told that there were 67 FAQs, and I was taken to a page displaying the first 10 only, even though there was ample space on the page to display 50 of them. Of course, there was nothing in the first 10 about credit card information updates. How do I change my pre-authorized credit card payment information? A f***ing empty page! That was the icing on the cake. I had no choice but to pick up the phone and call the 1-800 number for Bell TV instead. Of course, I had to wait 15 minutes before I actually got through to a human being. As per usual, the person, with a barely understandable foreign accent, asked me for my phone number, even though I had punched it in 10 minutes before during the process of going through the automatic 1-800 number menu options. (Why ask for it, if you’re going to ask for it again anyway?) And I had to identify myself and blah blah blah. And so, after forty-five minutes, I was finally able to change my credit card information with this person, albeit with an obviously error-prone live human conversation instead of what should have been a perfectly reliable, secure on-line account information modification. And then of course I had to go through it all over again for my cell phone service, because it was not the same service, even though both services are with Bell Canada and both are accessible through the same on-line Bell.ca account! So I was put on hold for another ten minutes and finally got to speak to another customer representative. The poor fellow actually had a normal English accent, and I just couldn’t resist the temptation to give him a piece of my mind about the whole situation. I just had to tell him to compare what I had just had to go through with Bell Canada with the situation with, say, the Amazon on-line store. There, I just had to log in, follow the obvious links to modify my credit card information, and bam! It was done in two minutes, with no human intervention and no risk of error (except in my typing). I asked the guy to just imagine what it would be like if people had to go through what they have to go through with Bell Canada with every company with which they have to update their credit card information when it changes. It would take people a whole day! It is absolutely ridiculous, and it is absolutely scandalous that such a large company, with such deep pockets and millions of customers that are effectively a captive market, is unable to offer a decent on-line experience with such basic tasks as changing one’s credit card information. The Bell.ca web site is a pathetic piece of sh*t, and since they have just revamped it, there is absolutely no hope that things will improve any time soon. Yet of course they will keep getting my money, because they are the only choice for satellite TV and for cell phone service in my area as far as I am concerned. But it is such a frustrating experience! For the record, for my third BCE service, the land line with the local phone company subsidiary, I had to go through yet another web site, which is not particularly pleasant to use, but at least is faster, lets you log in with a four-digit passcode (which is not a particularly secure approach in my opinion), and—gasp!—actually lets you change your credit card information right there, right then. Alas, I already know, from my previous experience with the exact same company two years ago (and three years ago), that this will simply not be enough, and that, due to atrociously long processing times, they will probably not have the correct credit card information in their system by the time the next payment comes up. I specifically waited until just after the day of the monthly payment for this phone company to activate my new credit card and ditch the old one, but I just know that, a month from now, I will get a bill that says that my payment failed and that I will be charged a late fee the next month. This is the wonderful world of BCE and its subsidiaries. I have a list of companies that I have to notify whenever my credit card information changes, and BCE and its subsidiaries are the only ones that make the whole experience atrociously painful, each and every time. And yet there is absolutely nothing that can be done about it, because we are a captive market, and our regulators are too busy gazing at their own navels to see what’s going on in the real world. This entry was posted by Pierre Igot on Tuesday, September 16th, 2008 at 7:10 pm	and is filed under Society, Technology. You can follow any responses to this entry through the RSS 2.0 feed. You can leave a response, or trackback from your own site. I can feel your pain. Last year I moved into a new house and the Bell technician not only couldn’t figure out how to install my line for some reason, but actually left live wires coming out from my wall! They are simply the worst, and Rogers is no better. I’m lucky enough to have Cogeco as my Internet and Cable Provider, and I use EuroTEL Canada for phone and long distance (waaaaay cheaper than Bell and you actually get to talk to a live person when you call them, not EMILY! ).